There’s a legion of support staff that help Bennett each and every day. Most of them work in special education at Bennett’s school — they are teachers, education assistants and therapists. They help him focus in class, support him in play with his peers and teach him prepositions or how to dribble a basketball. Outside of school Bennett’s world expands to include doctors, specialists, babysitters and respite workers, swim instructors, volunteer adaptive ski instructors and soon, camp counsellors. They all do a small job in helping Bennett function and integrate into the larger world, by prescribing medicine, building his confidence on skis or helping him have an incredible summer filled with games, hiking and swimming. And then there are the trusty folks who act as his conduits between his two worlds: the bus drivers who get Bennett to and from school safely every day. Bennett rides the bus to school and has since he was three. 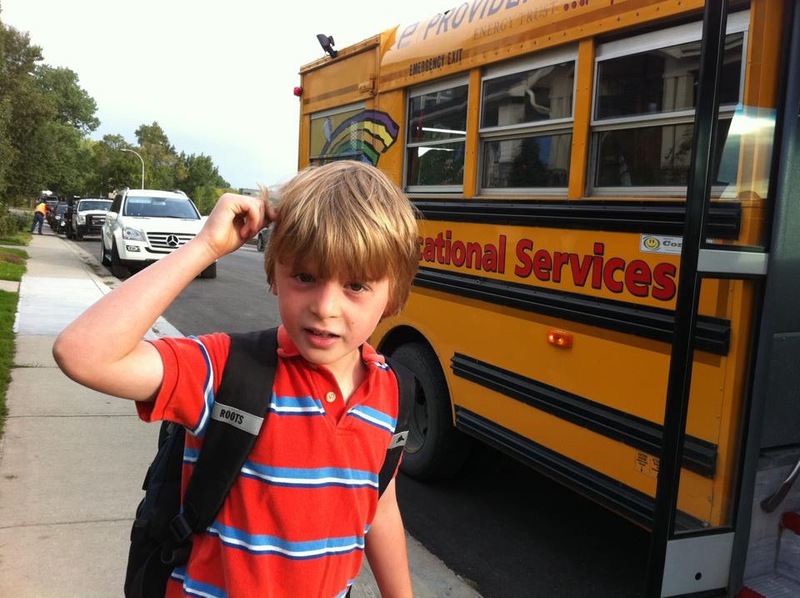 Bennett has been riding a bus to school since he started at Renfrew at the age of three. We’ve had many different bus drivers over the years — and some repeat drivers — and they always greet Bennett with a smile in the morning and send him off with a wave in the afternoon. They patiently wait while Bennett dawdles his way to the bus, and drags his feet getting off after school (he doesn’t want to stop watching the TV screen!). 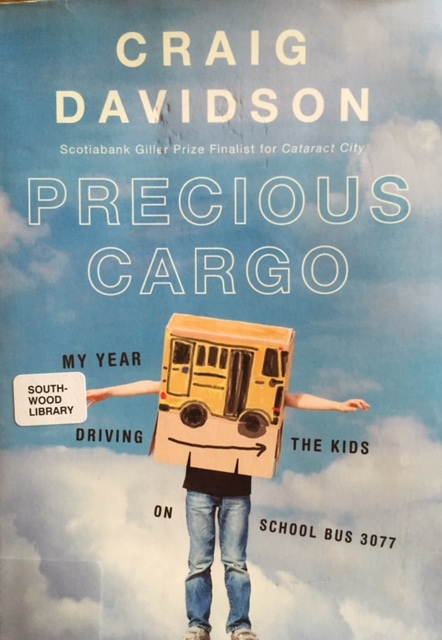 But I never really stopped to think about what the job might be like for them until I read Craig Davidson’s book, Precious Cargo: My Year Driving the Kids on School Bus 3077, this spring. The book chronicles his experience driving a busette of differently-abled junior high and high school kids in Calgary. Davidson, who previously had no experience with people with special needs, finds himself leaning to operate a wheel chair lift on the bus, getting to know his charges through daily conversations and banter, and even defending them against a high school bully and the bully’s father. He learns a lot about himself along the way. It’s a great book: serious and poignant, but with hilarious bits, too. I got to thinking — after a note home about a month ago informing me that Bennett had been hitting another boy on his morning bus — these wonderful Renfrew drivers really must be a special breed. The kids at Bennett’s school range in age from three to 12, and even greater is their range of conditions, from autism to cerebral palsy to Down Syndrome. The drivers likely endure tantrums, screaming or even children who unbuckle and get loose inside the bus while it’s hurtling down Deerfoot Trail! And they have to know how to handle all of these situations, including my eight-year-old with loose fists after the morning commute! Yet despite what must be a lot of stress, plus driving in Calgary rush hour traffic (arguably more stressful), they always greet the kids with a big smile and are still smiling at the end of the day. Their patience and dedication helps Bennett’s life run smoothly — and by proxy, ours — and I can’t imagine how we’d keep all the balls in the air if that bus with the rainbow didn’t pull up at 8:15 every morning. Thanks for driving my precious cargo! Pineapple and basil go well together in a tart and savoury flavour combo that cries out for cocktail experimentation. So I made this drink, which is like the love child of a mojito and a gin fizz, with basil instead of mint and tequila rather than gin. A squeeze of lime tones down the pineapple’s sweetness and a touch of agave syrup takes away the spirit’s bite. 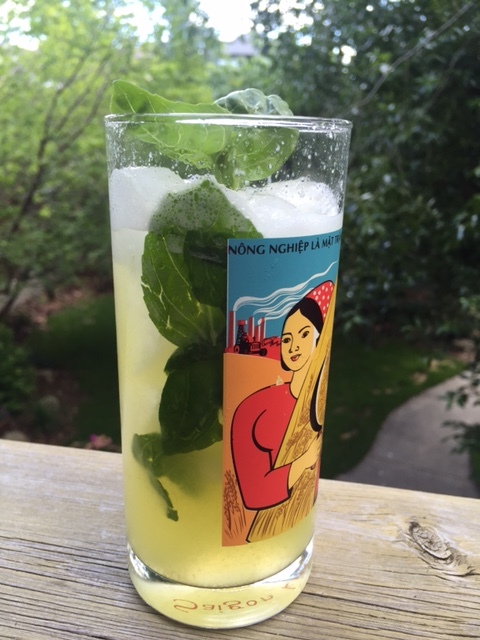 Lengthen it with soda water and you’ve got a pretty, refreshing summer sip. Enjoy! What to do with all that fresh basil from the garden? Just add tequila, pineapple juice and a splash of soda. Method: In the base of a cocktail shaker, muddle basil gently with tequila, pineapple juice, lime juice and agave nectar. Add ice and shake. 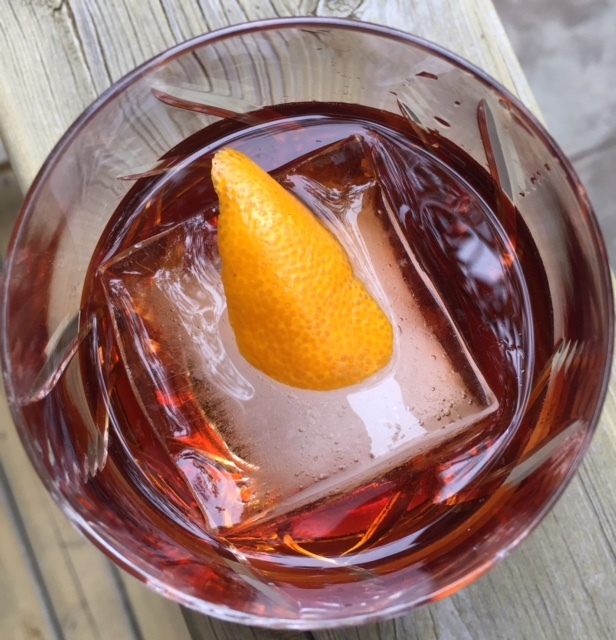 Pour into a Collins glass, add ice then top with soda water (about 1 oz). Stir and garnish with a fresh basil sprig. “If most of the big dinosaurs like T-Rex lived during the Cretaceous Period, why didn’t they call it Cretaceous Park?” I asked, pondering all-things-dino inside the visitor centre at Dinosaur Provincial Park. “Because Jurassic Park sounds better,” deadpanned Blake. Avery agreed, and soon found more evidence that Hollywood embellishes its movies: the giant, terrifying Mosasaurus sea dino from Jurassic World was, in real life, only about 40 feet long (still huge), but nowhere near the 100+ feet depicted in the blockbuster. 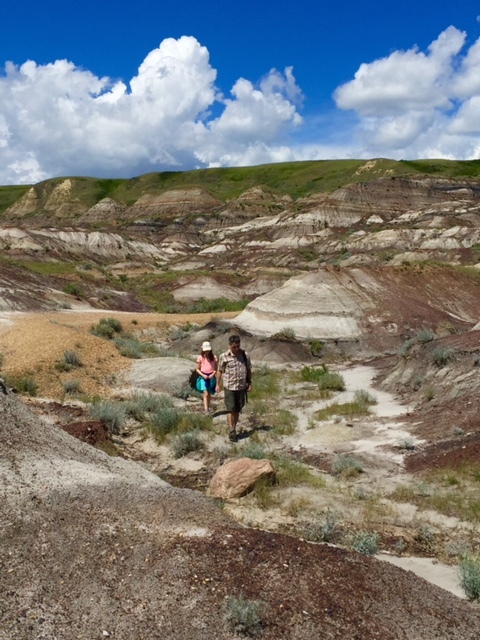 It had been four years since our family had done anything remotely dinosaur-y in Alberta, so when an opportunity arose to try comfort camping in Dinosaur Provincial Park, we didn’t hesitate. Centrosaur Quarry Hike at Dinosaur Provincial Park. The park, located just a half hour north-east of Brooks, is stunning. Its five interpretive trails meander through the surreal hoodoo- and coulee-ridden landscape, and also through a grove of ancient cottonwood trees. 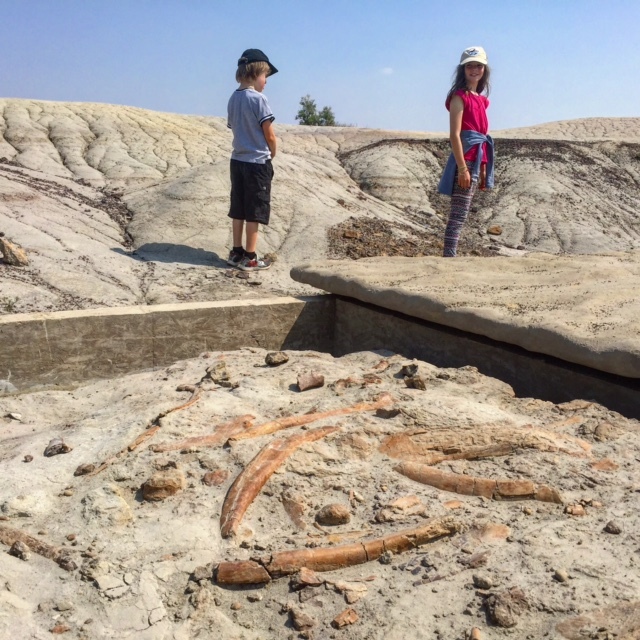 Plus, as part of a story for the Calgary Herald, running this weekend, we got to experience the Centrosaurus Quarry Hike with a guide who not only informed us of the truth about Mosasaurs, but helped us learn to spot fossils in the extensive bone bed. 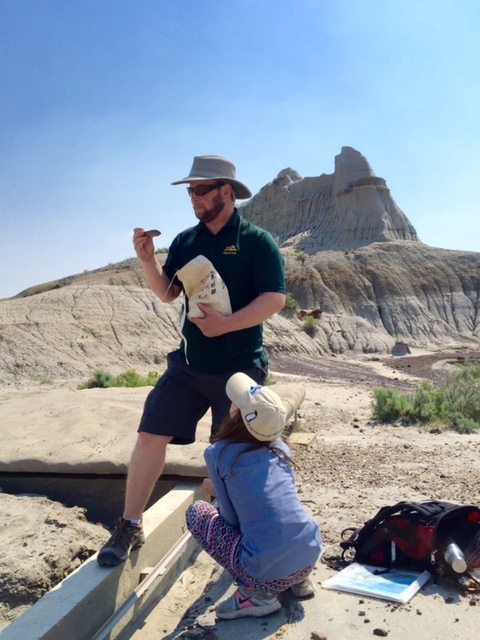 Guide Jarrid Jenkins educates us about Centrosaurs and their fossilized remains. The kids loved the park and we decided to return to dinosaur country a few weeks later, on Father’s Day, to visit the Royal Tyrrell Museum in Drumheller and search for fossils there. The museum is fantastic, weaving a tale of the province’s geological history — that included tons of dinos during the Cretaceous Period — with awesome dinosaur skeleton displays created from original fossils and some casts. 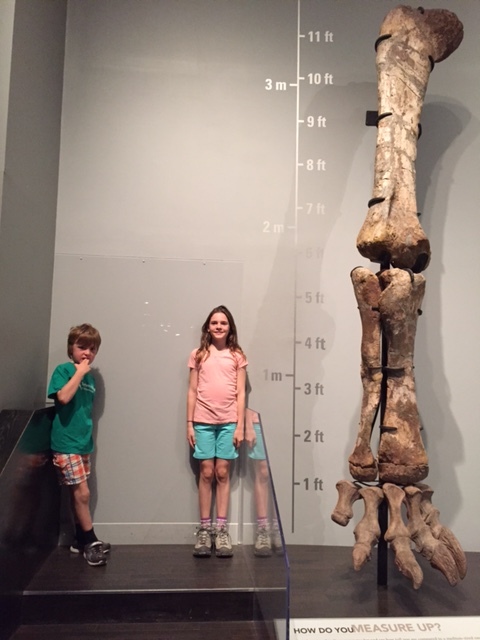 The kids don’t quite measure up to this T-Rex leg inside the Royal Tyrrell Museum. Afterward, we put our new fossil-hunting skills to the test on the short interpretive trail adjacent to the museum, and were soon rewarded with a huge discovery. Blake likes to travel off-path, along gullies that churn with water after rainstorms, where the most erosion occurs that can reveal new fossils. Sure enough, I stumbled upon something sizeable: I like to think it’s part of a head or pelvis. 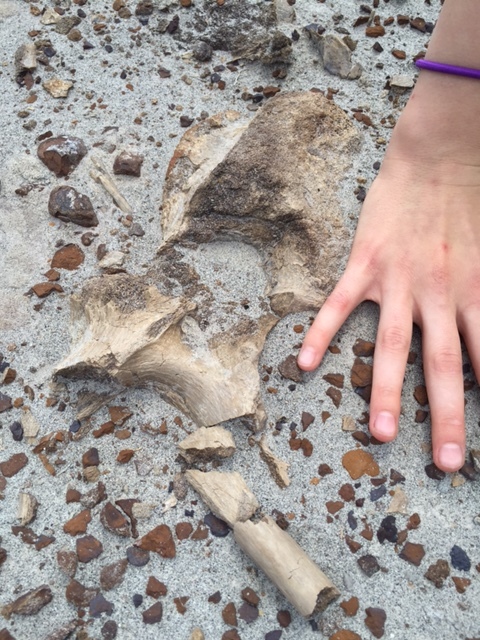 Avery’s hand next to the dinosaur fossil, for scale. And, like the budding palaeontologists we’re becoming, we reported our “find” to the front desk after the walk. We also left it there for other families to discover. Thanks for the awesome dino double-header, badlands — we’ll be back soon! Avery and Blake hiking in the badlands near the Royal Tyrrell Museum. My kids aren’t physically literate. Are yours? Her self-assessment came after I explained the concept of “physical literacy,” which is the movement equivalent of reading or adding. Basically, a child who is physically literate has mastered basic movement skills and is comfortable running, jumping, balancing, spinning, throwing and catching, etc., across a range of activities. 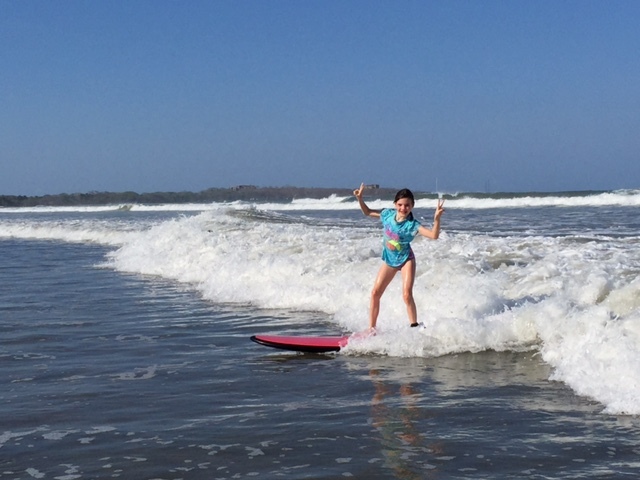 Avery has great balance and can surf, but needs to improve her manipulation skills (throwing, catching and kicking). So her throwing doesn’t improve, and as a result, she prefers non-ball activities, like capture the flag, or obstacle courses. This failure to acquire basic physical skills is a growing problem — and not just with kicking and throwing, there are plenty of children who are great at soccer but can’t ice skate or do a cartwheel — and one I address in a story on physical literacy, for Today’s Parent, online today. The story coincides with the annual ParticipACTION Report Card on Physical Activity for Children and Youth, also released today. 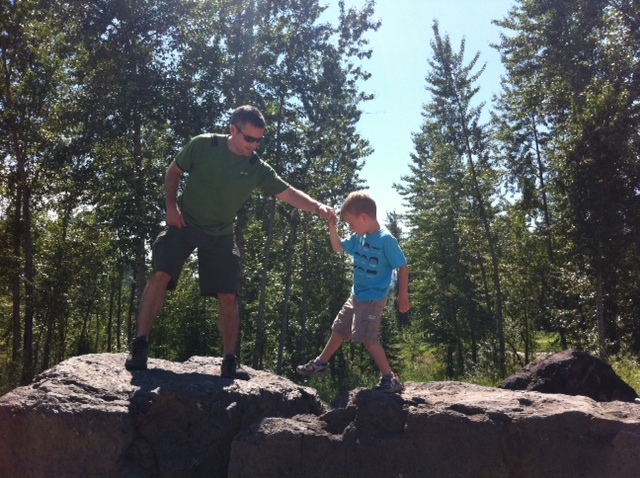 Blake helps Bennett with some rock hopping in Fernie, B.C. This year’s Report Card shows that kids are not physically active enough (Overall Physical Activity earned a D-). What’s more, they’re also struggling with physical literacy, which was graded for the first time and earned a D+. The fact that kids aren’t active enough isn’t a big surprise — we’ve long been wringing our hands over increasingly sedentary kids and growing rates of obesity and childhood diabetes. But what my story and the report revealed to me is that while schools and parents spend a lot of time making sure their kids can read and do math, when it comes to focusing on the physical skills that will ensure they stay active for life, we fall short. Could there be a connection between this lack of basic movement skills and the fact activity levels drop off as kids get older? If you never learned how to hit a ball well, you’re not going to suddenly take up tennis, after all. 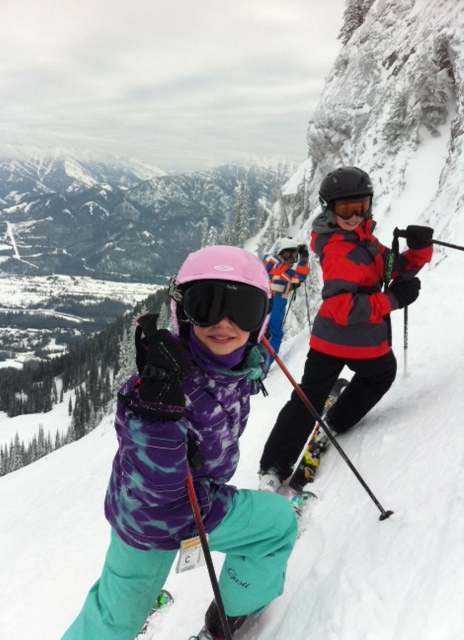 Avery can ski a black diamond, but might miss a ball if you throw it at her. I always thought we did a pretty good job of being active with — and active role models for — Avery and Bennett. We hike, ski and swim as a family. We also have a trampoline that the children love. Avery has tried gymnastics, dance and karate, and through Girl Guides she’s been ice skating and inline skating. She’s also comfortable on a bike and a scooter. So, her locomotor and stability skills are great — it’s the manipulative skills, common in ball sports, that could use some work. Bennett, who has autism and a chromosome condition, has always struggled with gross and fine motor skills. 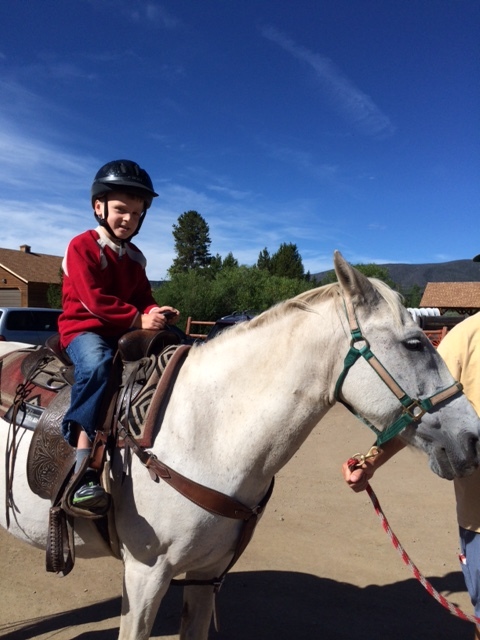 Since he finds many physical activities challenging to begin with, we’ve gravitated toward what he likes — horseback riding, swimming and hiking. He isn’t even close to physically literate, even though he’s been exposed to a wide range of activities. As a result, there’s a lot he can’t do, and will probably never be able to do. Bennett loves horseback riding. Give him a saddle over a soccer ball any day. The question is, should we be doing more as parents? Honestly, the thought of making the kids work on their kicking, throwing and catching is exhausting, partly because I’m just not that into balls. As it is, I have to bribe Bennett with chocolate to get him to ride his adapted bike! Perhaps schools could do a better job teaching those skills — and that will likely happen in junior high and high school, at least for Avery, when she’s forced to join a team (that’s when I played basketball and volleyball). But here’s the thing: I was never great at soccer or softball, either. Like Avery, I gravitated toward gymnastics, trampolining and skiing, and as an adult, hiking and bike riding. I don’t play on any adult leagues, but I’m still physically active. Am I physically literate? I probably was back in 1989, but like my ability to write essays in French and solve calculus equations, those movement skills have faded with time. The best I can hope for is that the groundwork we’re laying for our kids — the hiking, daily walks, skiing and swimming, regardless of whether they become physically literate — will rub off on them and inspire them to be active for life.